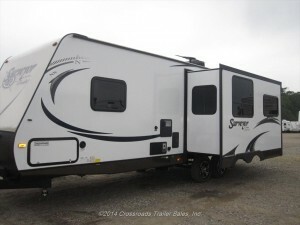 If you happen to be in the market for a new RV and have decided that a towable trailer is what you’re looking for, the next step is to choose between a 5th wheel and a travel trailer. Choosing between the two can be tough because both trailer types have so much to offer and the features they include these days straight from the manufacturer are better than ever. Here are a few of the questions you should be asking yourself that will help you decide on which trailer best suits you. 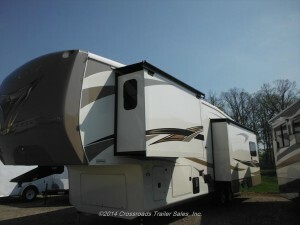 The first thing to look at (which might fast track your decision) is what you can spend on a new camper. A 2014 5th wheel with comparable length to a 2014 travel trailer will typically have an MSRP of somewhere around $10,000 – $20,000 higher. If you’re looking for a new RV but are on a limited budget, a travel trailer may be the right option for you. 5th wheels are usually much larger and have more luxury features (outdoor kitchens & entertainment centers, storage, furniture, appliances, etc.) that result in higher prices. However, if a 5th wheel is more appealing to you, you may have to look at models that are a few years older to see a significant drop in price. Also, you’ll need to consider that because fifth wheels are larger and heavier, your gas mileage will suffer and owners will experience an indirect additional expense there too. What will I be towing my trailer with? The vehicle you will be using to tow your trailer is very important when deciding on which type of unit to purchase – and if you don’t already own a tow vehicle, this will be a whole other decision to make. Keep in mind, if you’re looking to go the route of a fifth wheel, you’ll have to purchase or already own a pickup truck. 5th wheel hitches are much different than standard bumper hitches that are used for travel trailers, so your Tahoe won’t be a viable option for a 5th wheel. If you already own a vehicle that is capable of towing either type of trailer make sure to find out how heavy of a trailer it can tow. **Check out our blog on choosing the right vehicle for your 5th wheel that touches on vehicle ratings. If you think a travel trailer is right for you and you need to purchase a tow vehicle, your options won’t be nearly as limited. The size of your family or the amount of people you plan on regularly traveling with will have to be well thought out. If you are a retiree and plan on traveling only with your significant other and don’t require a lot of space, a travel trailer might be just fine for you. You would be hard pressed to find a camper that doesn’t have a full kitchen, bedroom with at least a queen size bed, and a living area with an entertainment center that is the perfect size for a couple. However, if you are traveling with your spouse and 2 or 3 kids, or just prefer a roomier camper, you might find that most travel trailers won’t afford you the space you’re looking for. It may be in your best interest to investigate a 5th wheel with bunk beds and a larger living area with hide-a-way sofas to accommodate all of your passengers. Regardless of which type of trailer you end up purchasing, you can rest assured that you are doing you and your family a great service! There is nothing quite like the camping lifestyle. Be careful though, it can get addicting!